Nearly half a century after its release in December 1965, Vince Guaraldi’s soundtrack to A Charlie Brown Christmas remains a steady seller; indeed, it has become one of the most popular holiday albums ever produced. No surprise, then, that other jazz artists have attempted to ride that success. Cyrus Chestnut covered the entire album in 2000, and now Nashville-based pianist Lori Medhem has released Christmas Is Coming: A Tribute to A Charlie Brown Christmas (Green Hill GHD5705). The “extras” include a lovely, lyrical cover of “Snowfall”; a gentle arrangement of “Winter Wonderland,” with percussive sleigh bells elements; and a playful handling of “The Christmas Waltz” that opens with a piano solo and then blossoms into a swinging toe-tapper that boasts solid work by the entire quartet. The additional Peanuts selection is a peppy arrangement of the "Charlie Brown Theme." 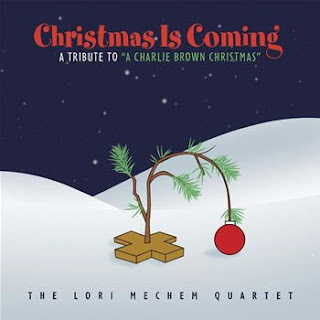 Mechem previously recorded half a dozen of these tunes on her 2005 holiday album, Brazilian Christmas, but the instrumentation and arrangements are new here: more of a traditional jazz combo approach, with (thankfully!) no strings. Very pleasant listening (although — of course! — no substitute for Guaraldi's original album).